I'm back! I haven't blogged in what seems like forever... Between being ill, being busy, being unmotivated and being ill again I just haven't found any time for blogging. I'm still suffering from a water/kidney infection but I want to get my blog back on track as I have spent so much time on it in the past year for it to go to waste. So I'm back today with another installment of my 2014 favourites! I really hope you enjoy this post. Although I loved a lot of eye products last year I tried to whittle it down. An eye shadow post will be coming soon though, as I couldn't whittle that one down! Urban Decay Primer Potion: I have oily lids so I need something to keep my eye shadows in place all day long and Urban Decay's Primer Potion does just that! It acts like a glue for my shadow and also counteracts the veins on my lid. Rimmel Brow This Way: My eyebrows are in serious need of TLC but I'm too scared to get them done by a professional! Because I'm too scared to fill them in I tried Rimmel's Brow This Way and it is the quickest way of filling your brows in, ever! Although some people have complained for the brush to be too big I just use it with a light hand to ensure I don't get it everywhere (I have busy brows anyway). Maybelline The Colossal Waterproof Mascara: I love this mascara because it gives me length and volume! I love waterproof versions too and the formula of this is excellent. L'Oreal Super Liner: Although this eyeliner packaging can break when it becomes old it is the best one I have found. I love the waterproof formula and the super blackness of it. It doesn't smudge and the brush is perfect for winged liner. Collection Glam Eyes Glitter Liner: Around Christmas time I liked adding a double eye liner to my look. I would add a normal black wing and next to it I would add a glitter wing. It was super easy and fun, it added sparkle to my plain winged liner! 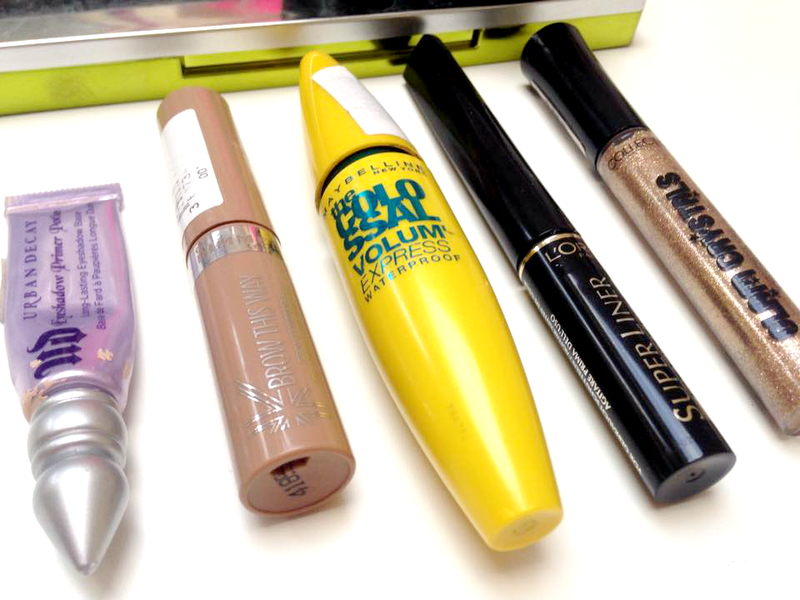 What was your favourite eye product of 2014? I've had the super liner on my wishlist for ages now! I must pick it up soon, ive been loving winged liner!